Free Christian Teaching By Dr Richard Kent. Bible evidence, facts and research by Dr Richard Kent. Dr Richard Kent. Is a retired medical doctor and full-time evangelist, He travels the world preaching the gospel of Jesus Christ and is involved with mission work on Death Row in the Philippines. He is the author of The Final Frontier and Beyond The Final Frontier. He is also an expert on Near Death Experiences and has personally interviewed over 300 people who have died, gone to either haven or hell, and returned to tell others about their amazing experiences. Caiaphas Prophesied About The Crucifixion. "And one of them, Caiaphas, being high priest that year, said to them, 'You know nothing at all, nor do you consider that it is expedient for us that one man should die for the people, and not that the whole nation should perish.'" The Ad 33 Date Of The Crucifixion From Bible Prophecy. The exact date of the entry of Jesus into Jerusalem is pinpointed with amazing accuracy in Daniel 9:23 - 27. This amazing work on the book of Daniel was first worked out by Sir Robert Anderson, Chief Inspector of Scotland Yard. He wrote an excellent book, "The Coming Prince", which has become one of the most important books in Biblical Eschatology. The most mathematically amazing Scripture in the Bible is found in Daniel 9: 25-26. In this Scripture the angel Gabriel is foretelling the exact date when Jesus Christ, the anticipated Messiah, would come to Jerusalem. This prophecy is mathematically correct to the very day. There is simply no other book on planet Earth which predicts the future with such stunning accuracy. "Know therefore and understand, that from the going forth of the command to restore and build Jerusalem until Messiah the Prince, there shall be seven weeks and sixty-two weeks; the street shall be built again, and the wall, even in troublesome times. And after the sixty-two weeks Messiah shall be cut off, but not for Himself." - The vision of the sixty-nine weeks in Daniel 9: 25, 26 pinpoints the coming of the Messiah. - The decree of Daniel 9: 25 took place on March 4th, 444 BC (recorded in Nehemiah 2: 1-8). - This leads to March 29th, A.D.33, the date of the Triumphal Entry of Jesus into Jerusalem"
- This is checked by noting that 444 BC to AD 33 is 476 years, and 476 times 365.24219 days per year equals 173,855 days. - Adding 25 days for the difference between March 4th and March 29th gives 173,880 days"
- It should be noted that the Babylonians used a 360 day calendar, which must be converted to our current Solar Years, of 365 days. - These 360 day years are commonly called prophetic years. Thus, the exact day when the Messiah would come to Jerusalem, riding on a donkey, was predicted by Gabriel to the very day. "Rejoice greatly, O daughter of Zion! Shout, O daughter of Jerusalem! Behold, your King is coming to you; he is just and having salvation, lowly and riding on a donkey, a colt, the foal of a donkey". The conclusion from Daniel 9: 23-27 is that the Bible is completely supernatural. The Ad 33 Date Of The Crucifixion According To Phlegon, A Secular Greek Historian. From the work of Phlegon we can work out the date of the Crucifixion. The Crucifixion is widely reported by numerous ancient writers. However, unlike the New Testament, of which there are 25,366 early copies, many of these ancient writer's manuscripts are fragmented. We do however have important sections of Phelgon's work, which are critical in dating the Crucifixion. Phlegon of Tralles was a first century secular Greek historian born not long after the Crucifixion. He inadvertently dated the darkness at noon on the day of Crucifixion in his work, The Olympiades. Phlegon's greatest work was the writing of a history book, called The Olympiades. The Olympiades can be used as a useful means of establishing a time-line. We only have fragments left to us of this monumental work and quotations of it from other writers. One such quotation is as follows, "In the 4th year of the 202nd Olympiad, there was a great eclipse of the Sun, greater than had ever been known before, for at the sixth hour the day was changed into night, and the stars were seen in the heavens. An earthquake occurred in Bythinia and overthrew a great part of the city of Nicæa." Africanus quoted a section of Phlegon's work as follows: "During the time of Tiberius Cæsar an eclipse of the sun occurred during the Full Moon." We believe that the period of darkness referred to by Phlegon is the same period of darkness referred to in the New Testament, since the event is unique. There is only one period of darkness lasting for three hours in the history of the world. - We believe that the event referred to by Phlegon is the same event that is recorded in the New Testament. - The timing of this "eclipse" referred to by Phlegon is similar to the event described in the Gospels. - Thankfully we have a more detailed fragment from Phlegon's Olympiades: "In the 4th year of the 202nd Olympiad, there was a great eclipse of the Sun, greater than had ever been known before, for at the 6th hour the day was changed into night and the stars were seen in the heavens. An earthquake occurred in Bythinia and overthrew a great part of the city of Nicæa." - We know from the Bible that on the day of Crucifixion the Sun was darkened for three hours, and there was a great earthquake. - As explained, we believe that the darkness referred to by Phlegon is the same darkness referred to in Matthew 27:45. - From the above statement of Phlegon we can work out the year of the Crucifixion. In ancient Greece the Olympic Games were held in the July of the first year of each Olympiad, which was a 4 year period running from July to June of each succeeding year. The 202nd Olympiad has been calculated to run from July AD 29 to June AD 33. The diagram below will help to clarify this. - Each year of an Olympiad began on 1st July. - We know that Jesus was crucified in the Spring, at the time of the Passover. - Phlegon had specifically stated in his Olympiades: "In the 4th year of the 202nd Olympiad, there was a great eclipse of the Sun, greater than had ever been known before, for at the 6th hour the day was changed into night and the stars were seen in the heavens." - Using the above information we can work out that the period of darkness occurred in 33 AD. - We can therefore calculate with great accuracy that the three hour period of darkness, and also the Crucifixion, had to be in the Spring of A.D. 33. - As several of the early Fathers quoted Phlegon, there seems no reason to doubt his word. - Another historian, Philipon (with Origen), confirms the historicity of Phlegon's statement by writing, "And about this darkness - Phlegon recalls it in the Olympiads...Phlegon mentioned the eclipse which took place during the crucifixion of the Lord Christ, and no other (eclipse), it is clear that he did not know from his sources about any (similar) eclipse in previous times ...and this is shown by the historical account of Tiberius Caesar." - Therefore the year of the crucifixion is A.D 33. There is more historical evidence to support the three hour period of darkness, and therefore of the Crucifixion, in 33 AD than almost any other ancient event in history! The Three Period Of Darkness Is Confirmed By Many Historians. The darkness that covered Israel for three hours was recorded by three of the four Gospel writers. 1. "Now from the sixth hour there occurred darkness over all the land until the ninth hour", Matthew 27:45. 2. "Now when the sixth hour had come, it became dark over all the land until the ninth hour," Mark 15:33. 3. "It was now about the sixth hour, and darkness came over all the land until the ninth hour, the sun failing" (Luke 23:44-45). The three evangelists testify that the darkness lasted three hours, and it 'covered all the land'. Thus the cause of the darkness was a failure in the Sun's light. This distinguishes the event from the mere darkness of dense thunderclouds that can cause near night-time conditions. Storms like this are unusual for Palestine, especially at Passover time. Furthermore, there would have been mention of prodigious rainfall. We should not think that the strange darkness was caused by an extended eclipse of the Sun, for that could not have occurred on the day of the Crucifixion. An eclipse of the Sun only occurs when the Moon is directly between the Sun and the Earth, thus blocking out its light. The day of the Crucifixion was the day before the traditional Passover, which was on the 14th Nisan. On the 14th Nisan there was a full Moon, as was always the case at Passover time. The Moon was therefore on the far side of the Earth away from the Sun. Furthermore, no eclipse of the Sun can last more than seven and a half minutes in any one place, and this strange darkness lasted for three hours. A supernatural event caused darkness to fall during Christ's death. Thus for three hours a strange darkness covered the land. The sky was clear, and the stars appeared. People would be asking themselves whether 'the end of the world' had come. The Jews knew from their Bible that 'the day of the Lord' would be 'a day of darkness'. In Amos 8:9 we read, "On that day, says the Lord God, I will make the Sun to go down at noon, and darken the Earth in broad daylight. I will turn your feasting into mourning, and all your songs into lamentations." This darkness speaks of a time of God's judgement upon sin. The following great number of ancient writers recorded the three hour period of darkness at the time of the Crucifixion. Tertullian lived at the beginning of the 3rd century, and recorded the three hour period of darkness at the Crucifixion. Lucian, the martyr of Nicomedia who died in A.D. 312, recorded the three hour period of darkness at the Crucifixion. Thallus, a historian writing in AD. 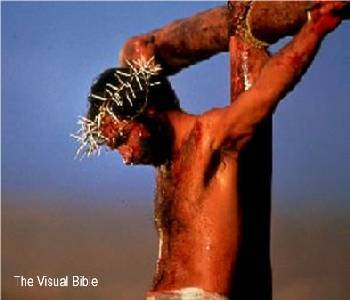 52, wrote to deny any supernatural elements accompanying the Crucifixion . Though his writings are lost to us, we have the quotations of other later writers. The writing of Thallus shows that the facts of Jesus' death were known and discussed in Rome as early as the middle of the first century, to the extent that unbelievers like Thallus thought it necessary to explain the matter of the darkness as something natural. He took the existence of Christ for granted. Neither Jesus, nor the darkness at his death, were ever denied. At the time of his writing, unbelievers had already been explaining the darkness at the time of the Crucifixion as a purely natural phenomenon. Julius Africanus, a Christian historian, writing about A.D. 221, refers to Christ's Crucifixion and the darkness that covered the earth prior to His death saying, "Thallus, in his Third Book of Histories, explains away this darkness as an eclipse of the sun, unreasonably as it seems to me. For the Hebrews celebrate the Passover on the 14th day according to the moon, and the Passion of our Saviour falls on the day before the Passover. But an eclipse of the sun takes place only when the Moon comes under the Sun. And it cannot happen at any other time but in the interval between the first day of the new moon and the last of the old, that is, at their junction: how then should an eclipse occur when the Moon is almost diametrically opposite the Sun?" Julius Africanus also stated that, "During the time of Tiberius Cæsar an eclipse of the sun occurred during the full Moon." Origen had written that this idea of it being an eclipse was an invention of the pagans to discredit the Gospels. Phlegon of Tralles was a first century secular Greek historian born not long after the Crucifixion. He wrote an historical work called The Olympiades, which can be used to date the darkness at noon on the day of Crucifixion (see below). Phlegon's work is referred to by Philipon, Julius Africanus, Joannes Philoponus, Malelas, Origen, Eusebius and Maximus. The Crucifixion of Jesus was noted by Cornelius Tacitus who was a Roman historian, born around 52-54 A.D. Tacitus stated that Jesus had been crucified by Pontius Pilate, and that Rome was in darkness during the reign of Tiberius the Caesar in AD.33. There is more historical evidence to support the three hour period of darkness in 33 AD than almost any other ancient event in history! Recording of The Crucifixion by Contemporary Historians. The Crucifixion of Jesus of Nazareth was noted by Cornelius Tacitus who was a Roman historian, born in 52-54 A.D. Tacitus stated that Jesus had been crucified by Pontius Pilate. Josephus was born in 37A.D. and was a Jewish Pharisee. He wrote: "Now there was about this time Jesus, a wise man, if it be lawful to call him a man, for he was a doer of wonderful works ..... Pilate ... condemned him to the Cross ... he appeared to them alive again on the third day." The fact is that the Crucifixion of Jesus Christ was accepted as fact by a great number of ancient writers. The Crucifixion was widely discussed as a fact by both Christian and secular writers, many of whom wanted to discuss the three hour period of darkness during the Crucifixion, which obviously greatly alarmed the ancient world. - Tertullian who lived at the beginning of the 3rd century. - Lucian, who died in A.D. 312. - Phlegon of Tralles was a first century Greek historian born not long after the Crucifixion. This large number of historians makes the Crucifixion among the best-attested events in ancient writing. The Children of Israel were in slavery to Pharaoh, who is a picture in the Bible of Satan. God commanded the Children of Israel to kill an adult male lamb, without any blemish. This is a Biblical picture of Jesus Christ. The lamb had to be slaughtered, and its blood placed on the wooden door posts, a Biblical picture of the Cross. None of its bones should be broken. This foreshadowed the Crucifixion when the Angel of Death passed over their house. Nobody in the house would die if the blood of the lamb was placed on the door posts. This is a picture of the Crucifixion. Nobody would suffer the wrath of God if they identified with the Blood of Jesus Christ, spilled at the Crucifixion, the Atonement by Jesus Christ for sin. Abraham took his only son Isaac to Mount Moriah to sacrifice him. Isaac was a full grown man, and carried on his back enough wood to consume a sacrifice. This foreshadowed Jesus carrying His wooden Cross. God prevented the sacrifice of Abraham's only son, and provided a male lamb "caught by its horns in a thicket." This foreshadowed the Crucifixion of the Lamb of God on Mount Moriah. Jesus was later "caught by His horns" on the Cross. The Blood Covenant In Relation To The Crucifixion. This covenant is fulfilled at the Crucifixion of Jesus Christ, as we will see later. In Genesis 3, God introduced the idea of a blood sacrifice by clothing Adam and Eve with the skins of dead animals. Adam and Eve were effectively clothed with a blood sacrifice, which is a Biblical Picture of the Blood Covenant. This is introduced in Genesis 3:21, "Also for Adam and his wife the Lord God made tunics of skin, and clothed them." In Genesis 9:13, God introduces the Rainbow as a sign of the covenant, "I set My rainbow in the cloud, and it shall be for the sign of the covenant between Me and the earth"
In Genesis 15: 9-17 we are told that God made a Blood Covenant with Abraham. Abraham and a "burning torch" passed between the slaughtered heifer, goat, ram, dove and pigeon. When God caused Abraham to pass between the two halves of slaughtered animals this was a type of Blood Covenant. Jesus Christ was the Burning Torch that passed between the pieces. Hidden Codes in The Bible. Equidistant Letter Codes were first discovered by Rabbi Ben Weismendal in 1958. We cover the Bible Codes in much fuller detail in our presentation The Bible is Supernatural on this web site. The most important of all the Bible Codes is the "Yeshua" codes (the name of Jesus in Hebrew). In these codes, the Crucifixion passages of the Old Testament indicate exactly Who they refer to. They refer to "Yeshua", which is Hebrew for "Jesus." "I am poured out like water, and all My bones are out of joint; my heart is like wax; it has melted within Me. My strength is dried up like a potsherd, and My tongue clings to My jaws; you have brought Me to the dust of death. For dogs have surrounded Me; the congregation of the wicked has enclosed Me. They pierced My hands and My feet." and the pleasure of the Lord shall prosper in His hand." In the above passage the code "YESHUA SHMA" is spelled out every 22nd letter, meaning "My Name Is Jesus". Bible Prophecy Concerning The Crucifixion. It is recorded in Genesis 3:14-15, "So the LORD God said to the serpent: "Because you have done this, you are cursed more than all cattle, and more than every beast of the field; on your belly you shall go, and you shall eat dust all the days of your life. And I will put enmity between you and the woman, and between your seed and her Seed; He shall bruise your head, and you shall bruise His heel." The Genealogy of Noah in Genesis Chapter 5 (from "The Bible: An Extraterrestrial Message" by Chuck Missler). The ancestors of Noah are recorded in Genesis 5. There are a total of 10 names, each with a specific Hebrew meaning. The English translations for the Hebrew words are recorded above from top to bottom. "Man (is) appointed mortal sorrow, (but) the Blessed God shall come down, teaching that His death shall bring the despairing comfort." In Numbers 21:8-9 we read, "Then the LORD said to Moses, "Make a fiery serpent, and set it on a pole; and it shall be that everyone who is bitten, when he looks at it, shall live. So Moses made a bronze serpent, and put it on a pole; and so it was, if a serpent had bitten anyone, when he looked at the bronze serpent, he lived". This is a most unusual story! The tribes of Israel used to carry around a wooden standard, about 9 feet high, with an insignia of the tribe written on material hung on the Crosspiece. God told Moses to hang a bronze serpent on this wooden Cross bar instead of the standard. Bronze indicates judgement in the Bible, as also does a serpent. The Serpent on a Pole is the Holy Spirit's picture language for God's judgement on Jesus Christ on the Cross. "As Moses lifted up the serpent in the wilderness, even so must the Son of Man be lifted up, that whoever believes in Him should not perish but have eternal life. For God so loved the world that He gave His only begotten Son, that whoever believes in Him should not perish but have everlasting life". vs. 1: "My God, My God, why have You forsaken Me?" vs. 6: despised of the people. vs. 8: He trusted in the Lord, let Him rescue Him; let Him deliver Him, since He delights in Him!" vs. 13: They gape at Me with their mouths, like a raging and roaring lion. vs. 14: I am poured out like water, and all My bones are out of joint; my heart is like wax; it has melted within Me. vs. 15: My strength is dried up like a potsherd, and My tongue clings to My jaws; you have brought Me to the dust of death. vs. 16a: For dogs have surrounded Me; the congregation of the wicked has enclosed Me. vs. 17: I can count all My bones. They look and stare at Me. vs. 18: They divide My garments among them, and for My clothing they cast lots. vs. 14, "His face was marred more than any man, and His form more than the sons of men"
vs. 3: "He is despised and rejected by men, a Man of sorrows and acquainted with grief. …..he was despised, and we did not esteem Him. vs. 5: But He was wounded for our transgressions, he was bruised for our iniquities; the chastisement for our peace was upon Him, and by His stripes we are healed. vs. 6: the LORD has laid on Him the iniquity of us all. vs. 11: for He shall bear their iniquities. WATCH: TO THE POINT WITH BIRGIT WHELAN AND DR RICHARD KENT. FREE CHRISTIAN TEACHING WITH BIRGIT WHELAN AND DR RICHARD KENT. Watch 100’s of videos with teachings by Dr Richard Kent. R-Mornings with Birgit and Richard. Jesus Carried The Cross-beam To Golgotha. The Timing Of The Night Before The Crucifixion. The Crowd Choose Barabbas Rather Than Jesus. This Is A Perfect Picture Of The Gospel. The Six "trials" Of Jesus. The Great Barrier Reef, Australia. The Anthropic Principle, The Fine Tuning Of The Universe. Our planet is exactly fine-tuned for the existence of man. Genesis 1:26-27: "Then God said, "Let Us make man in Our image, according to Our likeness. So God created man in His own image; in the image of God He created him; male and female He created them". The YESHUA codes and the Crucifixion: The Name of Jesus in Old Testament prophecy. READ HERE. The Shroud Of Turin Actually Proves The Resurrection Of Jesus Christ. The Shroud of Turin has been a mystery for many centuries, and is discussed in great detail in our teaching on THE SHROUD OF TURIN PROVES THE RESURRECTION OF JESUS CHRIST on this web site. Fossils are found all over the planet, and are widely taught to have been formed, during the Evolutionary process, over millions of years! However, this simply does not make sense! The Bible opens with these majestic words: "In the beginning God created the Heavens and the Earth," Genesis 1:1. The 'One Day Is Billions Of Years' Theory. Some Bible teachers believe that each of the days of Creation was billions of years, presumably to fit in with the modern Theory of Evolution. Dinosaurs are Mentioned in the Bible. Most people in Western cultures have been taught to accept unquestioningly certain principles, one of which is the Theory of Evolution. In 1952, DNA was discovered. It may have been discovered, but it is so complex that it will never be understood. There is only one way to make certain that Heaven is our destination when we die. 25 Stories from The Final Frontier. He Who Seeks Finds Said Jesus. Copyright Simon Brown.. Travel theme. Powered by Blogger.